The canals in England and Wales are unique in their heritage and design and as such can be a little confounding as to what exactly it’s all about. 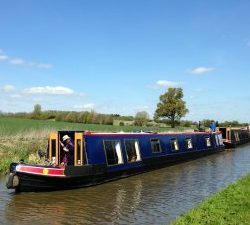 Below we try to explain some more about the boats, the canals themselves and the boating terms we use. A boat offering holidays where guests are accommodated on the boat overnight. They carry guests who book as individual customers, either on their own, as a couple, small group or occasionally can be chartered by one larger group. In the early days of hotel boats, old working boats were normally converted by adding a cabin over the hold to create accommodation for guests. Nowadays the boats are generally purpose built and provide all the modern amenities associated with modern living. Bywater’s pair of hotel boats both have central heating, fully en-suite facilities in every cabin and provision of UK domestic 240v power supply. A term in modern usage for craft unique to the English and Welsh narrow canal system. These boats are 7ft wide and can be up to 72ft long (the maximum dimensions of the locks they travel through). Bywater hotel boats are both narrow boats with the maximum length of 72ft. Two boats, one powered, the other unpowered operating together. The powered boat tows the unpowered boat (the butty) behind. Once a requent sight on the canals as pairs of working boats plied their trade. Now there are a few heritage pairs remaining but the last working pairs can be said to be hotel boats. Term used to describe a boat with a beam wider than 14ft. Several hotel boat barges operate on Rivers such as The Thames or Severn and the Caledonian Canal in Scotland. Non-powered boat when working as part of a pair with a motor boat. The term is derived from ‘buddy’ ie. mate or friend. The stern of a butty looks very different to that of a motor boat, lacking as it does, a propeller. It has a rounded swim to help it move through the water with ease and a large rudder or ‘ellum’ which is used to give it steerage. A boaters pronunciation of ‘helm’. Used to describe the rudder of the butty. Traditionally made of wood, but nowadays can be made of steel. Boats that carried cargo. Usually with a short back cabin for crew and a long open hold for carrying many different types of cargo: coal, pottery, perishables and grain, to mention but a few. The first working boats would have been horse drawn, before the introduction of the engine. Over the years of canal carrying each company had their own livery and colours which the boats were decorated in. The bright paintwork helped identify the company’s boats and their crews to other boaters as they sped past one another. As the artwork on the boats developed mages of Roses and Castles became a predominant theme, along wth a few other designs such as hearts and diamonds on sliding hatches. Much research has been done to seek out why this came about, but no firm answer has been found, no more than to say that the colourful decoration of the boats lifted the moods of the families that lived in the very difficult conditions of the back cabin. 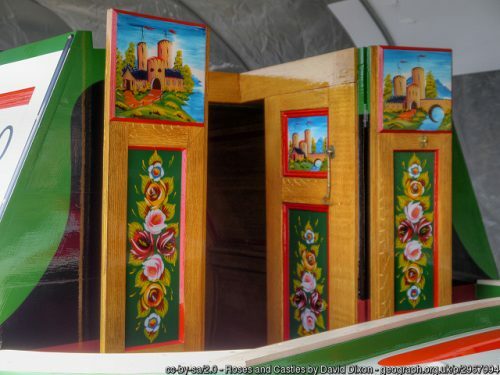 This included not just the colourful paintwork but also the brass items that adorn the boats, the lace plates, buckby cans and ropework, most of which also had a useful purpose in the everyday life of the boat families. This became such a strong folk tradition that modern leisure narrowboats don’t look complete without a bright livery and decorative rose and castle scenes to continue the tradition. Boaters term for the canals. These waterways were literally cut out of the land. A lock is a simple and ingenious device for transporting a craft from one level to another. When both sets of gates are closed it may be filled or emptied using paddles. In this picture you see the inside of a wide lock(14ft width), with the bottom gates, nearest and open so the boats can enter. At the far end of the lock you can see the water leaking from the canal above, which is several feet higher up. Locks come in many different shapes and sizes, some are a narrow 7ft, others over 14ft wide. The deepest will drop or raise a boat around 20feet, the shallowest, just a few inches. This lock is an unusual turf lock, where the sides of the lock don’t go all the way up, this made engineering a little easier and has the unusual feature of plant life in a section of the lock which gets flooded every time a boat rises or drops in the lock. Where there are a number of locks in close succession this is called a flight. Where there are 2 locks next to each other and the top gates of one are the bottom gates of the next, this is known as a staircase. A waterway worker who would, in the past, have lived in a cottage over looking a lock. Nowadays, most locks are not manned and the cottages are rarely lived in by British Waterways Staff. There are still some, however, such as the Thames lock keepers who continue to work and help boaters along their waterway with their experience and expertise. It has become an annual event when hotel boat operators vote for the best lock keeper of the year award, by way of thanks to those lock keepers of most note. During the heyday of commercial carrying there were over 2000 miles of canal network that were owned, managed and maintained by private canal companies. After the decline of carrying many canals were legally abandoned and left to nature. Some survived as water feeders or by eking out some income from minimal carrying or leisure use. Others dried up completely. Practically every disused canal now has a restoration society, made up of individuals and local campaigners trying to reopen large parts of our industrial canal heritage for leisure use. 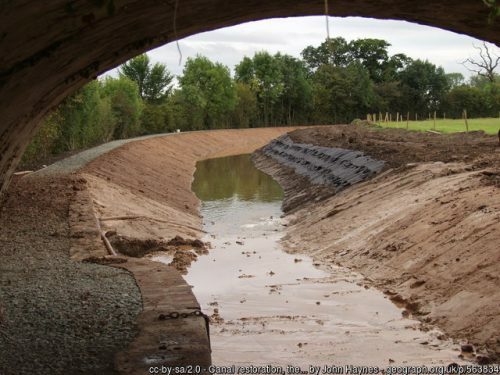 This is a picture of a canal which had dried up completely and is currently undergoing restoration. You can see the dry bed with new stone bank for moorings. 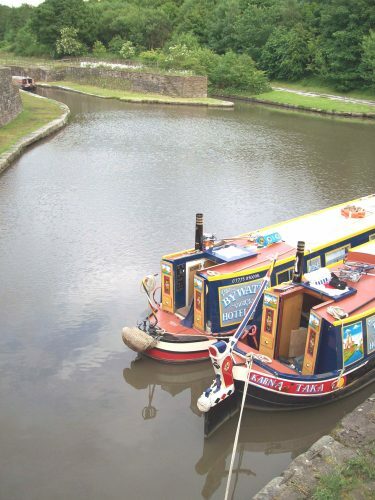 This length of canal may be reopened for boaters for the first time in 50 years in 2012. All narrow canals were built for horse drawn boats. The towpath is the walkway along one side of the canal that would have been walked by the horse and driver to tow the boat. These are bridges which cross the canal and take the towpath from one side to the other. Because canals were originally built for horse drawn boats the bridges needed to be designed in such a way that the horse could cross easily without the obstructing the rope, so they have this wonderful curved shape to them, which on some canals is very ornate. 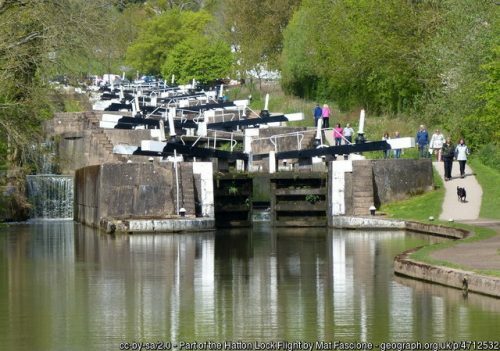 After having passed through a lock, back setting is the action of closing the gates, going back to the other end of the lock and raising a paddle to start reversing the lock for the benefit of the boat behind. Also known as turning a lock round. Towing a butty by hand in flights of locks, where it is quicker for the motor to go on ahead and back set the locks for the butty following behind. It normally only requires one person to bow haul (while one steers). The rope doesn’t actually come from the bow but a point about 1/3 of the way back. Breasted up for the night. 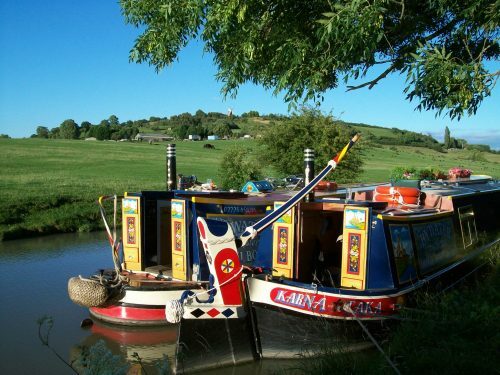 A pair of narrowboats can be lashed side by side. This has advantages, such as freeing up the butty steerer for other duties and is mainly done on rivers where the waterway and locks are wide enough for other boats to pass with ease. Pairs of hotel boats may moor breasted up overnight. A stud or upstand on the counter at the stern of a motor boat, to which lines are secured when towing or mooring. The action of winding down a lock paddle. The action of pushing the boat away from another boat, the bank or other obstacle in order to avoid or minimize a collision. To go ahead on foot or bicycle to set locks ready for the boats, to avoid unnecessary delays. Working boats and hotel boats do not expect to stop before entering a lock, unless it is already in use by another boat, since this can waste an inordinate amount of time in a full days cruising. Normally done by crew members but some guests on the hotel boats will also help. Two very short pieces of rope which tow the butty close behind the motor. The straps come from dollys on the stern of the motor and cross over each other to the butty’s T-stud. Rarely used by working boats (apart from when the butty was empty), however for hotel boats, this is the predominant method used. The term used to describe the length of rope used to tow the butty, normally between 70-90ft in length. In this picture you can see the long line between the boats. The butty sits to one side of the motor to avoid the disturbed water from the propeller which slows it down more. A shorter rope used to tow the butty, usually away from locks. The act of stopping or slowing a boat by wrapping a rope round a bollard or ‘strapping post’ and easing the rope out until the boat comes to a stop. Used in particular for buttys which have no engine to slow themselves down. A metal hook attached to the stern of a butty for securing lines. Originally used for attaching lines to the boat behind when a train of boats were pulled through a tunnel by a tug. A hotelboating term used to describe the activity which takes place to prepare the boat or boats for the next cruise and new guests. An open area at the front of the hotel boats which may have seating for guests with an unobstructed view of the of the waterside. Pronounced ‘win-ding’, the process of turning a boat round. This can usually only be done at specified locations where the canal has been widened and a ‘winding hole’ created. In the days before boats were fitted with engines, the wind would have been used to assist the turning, where convenient. A metal handle used for operating the lock paddles at locks. Carried by boaters and now also commonly called a lock key. We must thank those, without whose contribution this page would have suffered greatly. The original idea for the text and content was thanks to ‘Precious cargo’ a book about hotel boats by one of its biggest fans, Robin Smithett. His glossary gave us the bare bones to which we have added numerous bits and pieces. All of which have been illustrated brilliantly by the many photographs we are sent by guests and crew each year.